Now this is a story all about how your holiday can be flipped, turned upside down. 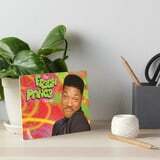 And I'd like to take a minute, just sit right there, I'll tell you where you can find gifts inspired by The Fresh Prince of Bel-Air. Hopefully, you actually rapped that intro to the beat of The Fresh Prince of Bel-Air's theme song, because it makes reading it a lot more fun. It also gives you all the more reason to take a look through this gift guide to find the perfect present for that Fresh Prince fanatic in your life. Whether they know every lyric to "The Fresh Prince of Bel-Air" (yes, the extended version, not just the show's version) or will drop everything and do the Carlton dance when Tom Jones' "It's Not Unusual" starts playing, there's something here for the freshest aficionados. Once you're done looking through those, feel free to take a deep dive into our list of ugly Fresh Prince Christmas sweaters, too.